I really like this! It feels like a physical toy. Did you see http://www.glorioustrainwrecks.com/node/842 Bee Time Trials: Championship Edition? btw I dig your avatar. I did! Spidercon is still my favorite. 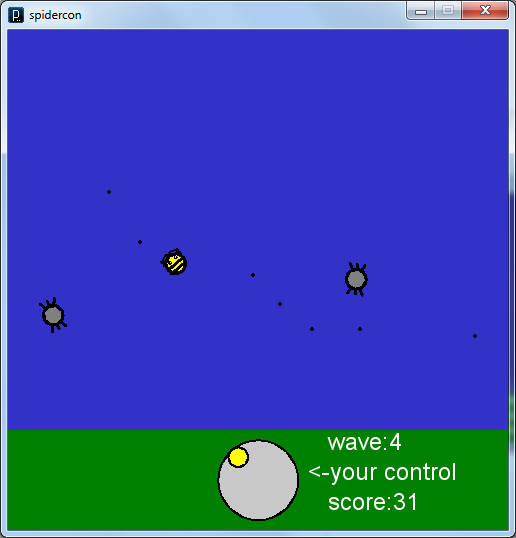 I modified Spidercon when I posted it here: http://kirkjerk.com/2010/03/05/ -- this version, the control is relative to to the spider rather than the control dial, so you have the option of using the mouse to help aim. Which do you think works better? Oh gee, I'm not sure. Moving is definitely easier in the second version, but shooting is definitely easier in the first one. 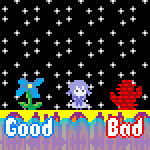 I like the first one a lot more, though, because it's a nonobvious control scheme that ends up working really well. I'd probably like the second one better if I were using a mouse, but I'm on a trackpad, which probably contributes to why I like the first one so much in the first place. How the heck do you run Java programs from the commandline?